The New York Times bestseller from the beloved author of A Three Dog Life—an exhilarating, superbly written memoir on friendship, family, creativity, tragedy, and the richness of life: “If you only read one book this year, make it this one” (Ann Patchett). In her bestselling memoir A Three Dog Life, Abigail Thomas wrote about the devastating loss of her husband. 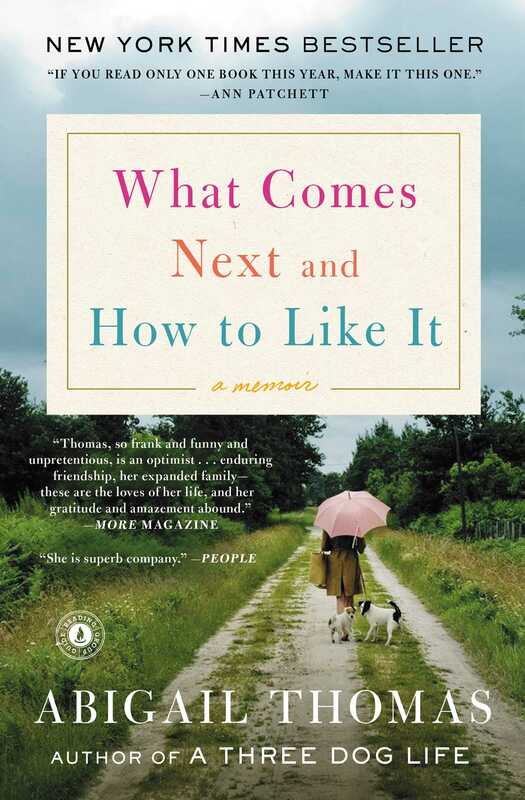 In What Comes Next and How to Like It, “a keenly observed memoir…Thomas writes of the changes aging brings us all and of coping through love: of family, dogs, a well-turned phrase. She is superb company” (People). Thomas was startled to overhear herself described as “a nice old lady with a tattoo,” because she thinks of herself as not nice, not old, nor a lady. But she has wondered: what comes next? What comes after the death of a spouse? What form does a lifelong friendship take after deepest betrayal? How does a mother cope with her child’s dire illness? Or the death of a cherished dog? Exquisitely observed, lush with sentences you will read over and over again, What Comes Next and How to Like It “is a beautifully felt, deeply moving memoir, the best work yet by a woman who has already done some of the best work in the field. Abigail Thomas is the Emily Dickinson of memoirists, and so much of this book’s wisdom is between the lines and in the white spaces. It may only take you two days to read, but the impact will stay with you for a long, long time” (Stephen King). This is a glorious guide to living imperfectly and exuberantly. This reading group guide for What Comes Next and How to Like It includes an introduction, discussion questions, and ideas for enhancing your book club. The suggested questions are intended to help your reading group find new and interesting angles and topics for your discussion. We hope that these ideas will enrich your conversation and increase your enjoyment of the book. Written in a series of brief, poetic chapters, What Comes Next and How to Like It is Abigail Thomas’s extraordinary examination of her life today—often solitary, yet still rich and engaging, filled with art, writing, children, grandchildren, dogs, a few suitors, and her longtime best friend. 1. Elizabeth Gilbert said of Abigail’s memoirs, “I come to her books as though to a feast, and leave fulfilled and transformed.” Did you feel transformed after reading What Comes Next and How to Like It? If so, in what ways? 2. This memoir is organized into four parts and many short “chapters.” Discuss the book’s structure. What purpose do you think it serves? 3. The second chapter, “Write a Book,” focuses on a discussion Abigail and Chuck have in which Chuck asks Abigail to write their story. How does this conversation affect Abigail’s telling of that story? 4. Abigail often finds herself painting, particularly landscape scenes on sheets of glass. How does she approach painting and writing differently? What does painting offer her that writing doesn’t? 5. Abigail’s feelings about Chuck and Catherine’s relationship change over the course of the book. How did their affair alter Abigail’s bonds with each of them? 6. Discuss Abigail’s relationships with the men in her life—her husband, her son, and Chuck. How do these relationships differ from her relationships with women—in particular, her three daughters? 7. It is no secret to readers of Abigail Thomas’s work that her dogs are important to her. Discuss her connection to her dogs; in what ways is it similar to the relationships she has with her human companions, and in what ways is it different? 8. Part III, “The Wilderness of Not Knowing,” focuses on Catherine’s battle with cancer. What does the experience teach Abigail? How does it change her? 9. At times, Abigail worries she is an alcoholic; other times, she enjoys three Manhattans before dinner without concern. Discuss Abigail’s relationship with alcohol and how it affects her moods, decisions, and perspectives. 11. Reread the final chapter, “Love.” What do you think Abigail means by her poignant last words? How do you interpret what she is trying to say about relationships, or about love in general? 12. Different moments in the book strike very different notes—of sadness and despair, joy and relief, love and fear. Ultimately, how would you describe What Comes Next and How to Like It? What feeling did the memoir leave you with? 1. Abigail Thomas’s writing is widely praised for being filled with memorable, lyrical sentences. Before your book club meeting, ask the members of your reading group to select their favorite passage or passages from the book. When you meet, share your selections and discuss why you chose the lines you did. What about them did you find particularly meaningful? 2. Abigail details an exercise she asks her writing students to complete: “Take any ten years of your life, reduce them to two pages, and every sentence has to be three words long” (p. 36). Try this exercise with your book club. Ask for volunteers to share their writing with the group. 3. Painting is a pastime that brings Abigail joy. View her paintings here: http://www.abigailthomas.net/paintings/. 4. To explore more of Abigail’s work, visit her blog at http://www.abigailthomas.net/blog/ or read one of her other memoirs: A Three Dog Life, a meditation on her relationship with her husband, Rich, after a tragic accident; and Safekeeping, in which she explores four pivotal moments that have shaped her life. Abigail Thomas, the daughter of renowned science writer Lewis Thomas (The Lives of a Cell), is the mother of four children and the grandmother of twelve. She is the author of six previous books, including the memoir A Three Dog Life, which was named one of the best books of 2006 by the Los Angeles Times and The Washington Post. She teaches writing and lives in Woodstock. "What Comes Next and How to Like It is a beautifully felt, deeply moving memoir, the best work yet by a woman who has already done some of the best work in the field. It's about friendship, and the shocks friendship can endure when it's true and deep. It's about the rueful pleasures (not to mention the jarring pitfalls) of getting old. It's about enduring tragedy, sickness, and loss. Thomas speaks of these big things by scattering the ordinary jewelry of everyday life: loving dogs (even when they chew your most precious possessions), Googling old boyfriends, rescuing an orphan mouse, and trees that try to grow in the crack between boards. Small speaks for large here, in a calm voice that talks to the mind while it fills the heart. Abigail Thomas is the Emily Dickinson of memoirists, and so much of this book's wisdom is between the lines and in the white spaces. It may only take you two days to read, but the impact will stay with you for a long, long time. Abigail Thomas fills memory with living breath." "This may be the most honest book I've ever read, by one of the most beautiful writers I know-- dizzyingly truthful, often funny, lyrical, wise." "I would follow Abigail Thomas on any journey she ever takes. The arrival of a new book from this master is always a cause for celebration, because I know right away that I'm about to learn something important about the art of writing and the art of living, both. I come to her books as though to a feast, and leave fulfilled and transformed." "This episodic memoir is full of love and life. Readers will identify with the feelings and the people even as they realize how different they are, how wondrous." “Irreverent, wise, and boundlessly generous." "Infused with [Thomas’s] signature sense of mordancy and wit…. all about depth offeeling, the experience of being a mother and a friend…its disparate piecesfall into exquisite place." “Full of love, humor, anger and a certain amount of uncertainty…. Although most of these passages are very short and read almost like journal entries, the overall picture Thomas conveys is that of the deep, soul-level relationships that exist between her and her family and with Chuck, connections that make all the highs and lows of life livable." “A keenly observed memoir…[Thomas] writes of the changes aging brings us all and of coping through love: of family, dogs, a well-turned phrase. She is superb company." "Beautifully written...wry...resilient. Her mature bones may not be all that flexible but her topics and sentences flip and cartwheel with the greatest of ease." "A nearly unforgivable betrayal in the middle of [a] long friendship somehow didn’t end it… and it’s this spirit of stalwart love and loyalty that makes Thomas’s work so moving... The result is a book that reads very quickly, but lingers long after." “Abigail Thomas knows adversity and how to make some kind of joy out of it… a meditation on aging and family that brings to mind Anne Lamott or Anna Quindlen… her gift is to never ponder too long on life’s woes." “Hilarious, wise, generous…full of interesting places and people and art and feeling and moment and thought." 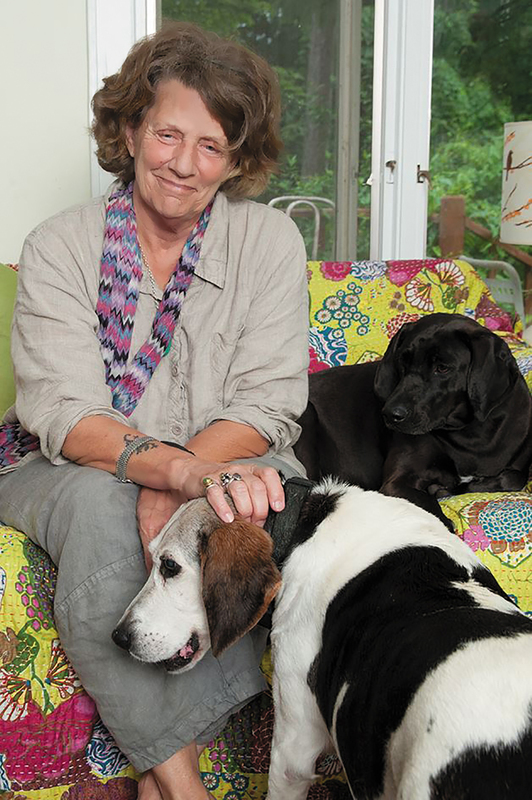 “Thomas has another winner with WHAT COMES NEXT AND HOW TO LIKE IT… a rich, multifaceted portrait of the author’s daily life in Woodstock, New York, with her beloved dogs. She is both forthright and self-deprecatingly funny … readers will treasure this journey with a writer who comes across as a compelling, lively friend." “The astonishingly rhapsodic What Comes Next and How to Like It is this master stylist's best work yet…One of the many gifts of What Comes Next is the news Thomas brings us from the front lines of old age, peppery and witty, neither romanticized nor denied."